Really looking forward to this show. 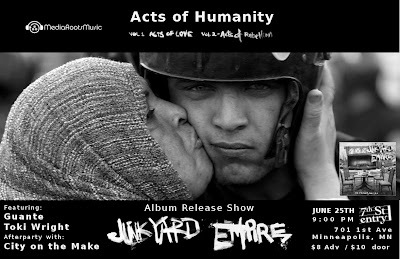 Junkyard Empire is super underrated, and they're one of the best live band hip hop acts around. More than anything, though, they wear their politics on their sleeves and really walk the walk. And Toki is one of the best MCs in the country, hands down. This is a hell of a lineup. Tell your peoples. Here's the FB event page. Also, huge thanks to everyone who came out to our Hip Hop Against Homophobia shows. It's been a great summer so far. Stay in touch on Twitter and Facebook.